Not really - instead they were flying reptiles. Huge creatures that took to the sky. 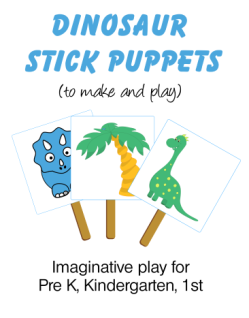 Find out how big they were, what they ate - facts, pictures and information for kids. 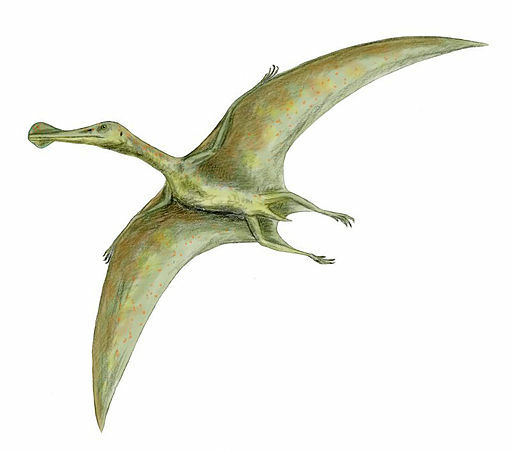 Pterosaurs (or 'winged lizards') were a relative of the dinosaur - but were not dinosaurs themselves. Unlike birds, they had wings made of skin, muscle and other tissues which stretched from an enormously long fourth finger to their ankles. They were the first animals to fly apart from insects. 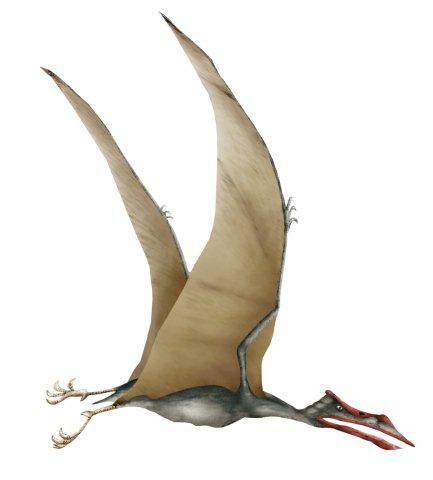 Pterosaurs had hollow bones filled with air which were extremly light - like the bones of birds. This would have made them light, helping their flight. Why are they not flying dinosaurs? Scientists use the word 'dinosaur' to mean a very specific type of creature. And this does not include Pterosaurs or most of the so called 'swimming dinosaurs'. One of the reasons is where their limbs are. Dinosaurs have their limbs under their body. But pterosaurs (like lizards and crocodiles), have limbs that stick out from the side. Pterosaurs and dinosaurs shared a common ancestor - but evolved in completely different ways into different creatures. Birds of today evolved from dinosaurs - and not from Pterosaurs. 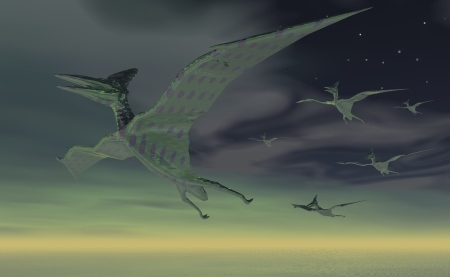 Pterosaurs ranged from being the size of tiny sparrows to giants the size of a small plane. Here are the names of some of them. Anbanguera - 'old devil'. Long sharp toothed jaws. Pteranodon - 'toothless'. No teeth, but a long crest on its head. Quetzalcoatlus - It is named after a legendary feathered serpent god of Mexico. Ornithocheirus - 'bird hand'. Fossil found in England. Rhamphorhynchus - 'beak snout'. Had short legs and a long bony tail. Feathered dinosaurs like Deinonychus couldn't fly. Instead the feathers probably helped to streamline them for running or keep them warm. Pterosaurs came in all different sizes. The biggest of them all was the Quetzalcoatlus, which was probably the largest creature ever to fly. It had a wing span of about 22 feet (10 metres). When flying it would have measured about 26 feet (8 metres) in length. People often refer to Pterosaurs as 'Pterodactyl' - but this isn't really a species. Instead it means a sub-group of pterosaurs called Pterodactylus. 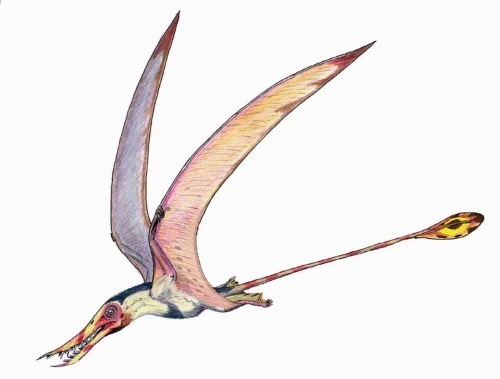 Most pterosaurs were fish eaters, although some may have eaten insects and small animals. They would have flown low over water and snapped up fish with their narrow jaws. One of them, the Pterodaustro had a tooth comb in its mouth. It would have strained water in its mouth to sift out tiny living things - a method called 'filter feeding'. Scientists think they waded in shallow water - like flamingos do today. Although flying is a good protection from predators, some would have become prey. One pterosaur fossil has been found with the broken tooth of a spinosaurus embedded in it! And it is likely that other meat eating dinosaurs would have dined on pterosaurs too.